The Guthy-Jackson Charitable Foundation is proud to announce our new podcast series. 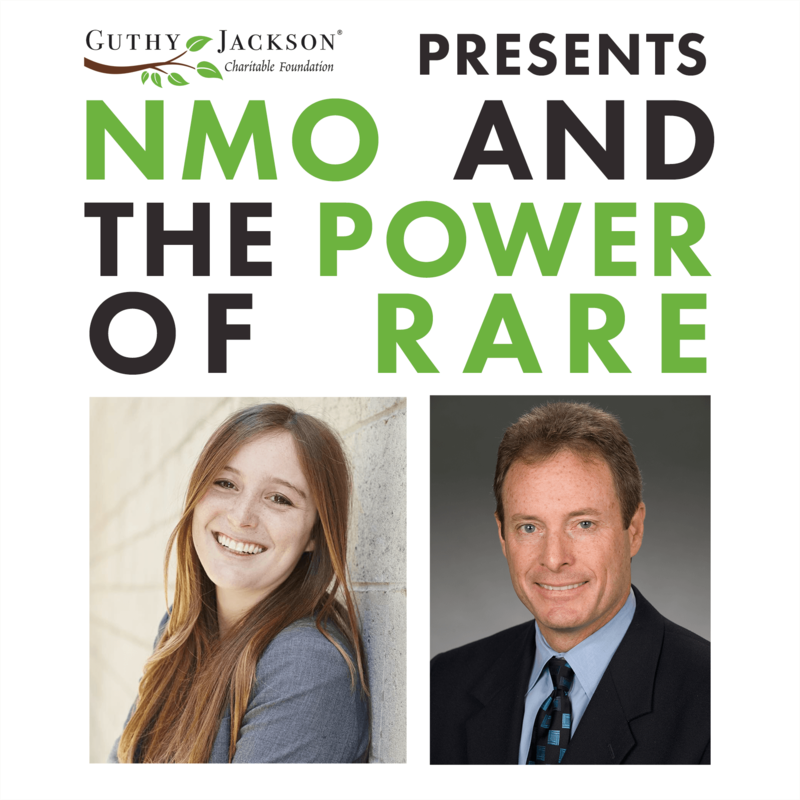 Join us for episode one as hosts Ali Guthy, Co-Founder, and Dr. Michael Yeaman, discuss the top five breakthroughs in NMO in the past five years. Also, they interview Dr. Nancy Sicotte, Director of the MS Program at Cedars-Sinai Medical Center, about possible future discoveries in NMO. Learn the facts about latest NMO research. NMO knowledge is growing at an incredibly fast pace. Mastering facts about NMO empowers you to take action. Engage in the healthy NMO conversation. Lend an open mind, a willing heart and a constructive voice to spread the word. From friends and families to physicians to philanthropists, everyone needs to know about NMO. Assess about options to be part of the NMO cure. There have never been more opportunities to be part of the NMO success story. Every hand and every voice counts. Decide how to make an NMO difference. Turning hopes into realities takes action. Set your goals. It is for each of us to decide how we can help change the world of NMO for the better. Click here to get started and become an NMO LEADer. More details to come. Neuromyelitis optica (NMO) affects the optic nerves, spinal cord and brainstem. NMO can cause blindness and/or paralysis. The Guthy-Jackson Charitable Foundation is dedicated to funding research in the quest to understand the pathophysiology and biochemistry of Neuromyelitis Optica (NMO) Spectrum Disorder. I lost complete feeling in both legs within 12 hours of feeling just fine. Entered Syracuse Crouse Hospital 11/9/16, They were not sure at that point what was wrong, but started 5 days of massive steroids and 6 sessions of apheresis 2 days apart. Also had very tight feeling in torso that feels like super tight corset (around the clock, never lets up). eyes were not affected.by NMO, but later found out that the steroids caused cataracts and both eyes had surgery(after I was sent home) and corrected problem. Then transferred to Syracuse Upstate University Medical Center for intensive physical therapy. (approx 4 weeks)Next came St. Camillus rehab center (in house care) til 3/23/17. Sent home where I had a few week home therapy, when she thought I accomplished all I could at home, so started out patient therapy . Stayed there til 9/29/17. At this time I could walk well with walker, sometimes walking with out it for short distances,touching chairs and counters when needed.) Got out to garage and drove myself around walking from parking lots to destinations by myself. On 11/12/17 relapsed and found myself in emergency room again with some movement in right leg and could only barely move tip of toes on left leg..tight corset feeling in torso still tight as ever. Went thru same steroid and plasma change, but started rituximab immediately after last blood session (11/22/17). Sent to Camillus rehab again where I am today. Tomorrow is my 3rd of 5 retuximab infusions for this round. I hope this info helps someone. A podcast connecting today's science with tomorrow's cures for neuromyelitis optica. Hosted by Ali Guthy and Michael Yeaman. Learn how clinical trials work, whether or not you're eligible to participate, and the possible risks and benefits. A disease is not rare if it affects you, so get the resources you need to join the community and get NMotion to solve NMO! If you know someone who has been diagnosed with NMO, please help us with blood samples and/or clinical data donations to our Biorepository. © The Guthy-Jackson Charitable Foundation. Sitemap. Terms & Disclaimers.